The development of any nation depends on the transportation networks and the ways in which they are being maintained. The same holds true for the development of a huge and populous nation like India. For connecting the areas and maintaining smooth flow of traffic, the construction of new and developed roads are a must. The same will be achieved with the implementation of the Bharatmala project. Under the scheme, a host of new roads will be laid down in the nation. Bharatmala Pariyojana is a new umbrella program for the highways sector that focuses on optimizing efficiency of freight and passenger movement across the country by bridging critical infrastructure gaps through effective interventions like development of Economic Corridors, Inter Corridors and Feeder Routes, National Corridor Efficiency Improvement, Border and International connectivity roads, Coastal and Port connectivity roads and Green-field expressways. The announcement of the mammoth scheme was done by Shri Nitin Gadkari, in the presence of the Prime Minister Shri Narendra Modi. The implementation of a pan-nation scheme to improve the road network was the idea of the PM. All key aspects of the scheme will be managed by the Road Transport and Highways Ministry of the country. I. The National Highways Development Program (NHDP) has reached a certain level of maturity. It is now important to re-define road development and have a macro approach while planning expansion of the national highways network. The focus has to be on recasting road development by bridging critical infrastructure gaps. II. Hence Bharatmala has been launched as a new umbrella program whose primary focus is on optimizing the efficiency of the movement of goods and people across the country. This program envisages a corridor approach in place of the existing package-based approach which has, in many cases, resulted in skewed development. For instance, in areas of high traffic, even upto 30,000 Passenger Carrying Units (PCUs), there are NH stretches of single and even intermediate lane. These have naturally become an impediment to seamless freight and passenger movement. III. The NH Network and ongoing programs - India has about 54.82 lakh km of road network, which is the second largest in the world in terms of length. National Highways (NHs) constitute about 2% of the total road network, but carry about 40% of the total road traffic. IV. NHDP spread across Phase-I to VII is the most significant program taken up so far by MoRTH. In addition, MoRTH is implementing other important programs like Special Accelerated Road Development Program for North-Eastern Region (SARDP-NE) for development of roads in the North East, and also the Left Wing Extremism (LWE) Affected Area projects. Funding for these programs has been separately allocated. The Page 2 of 12 program of upgrading single-lane National Highways to at least two-lane with paved shoulders through Externally Aided Projects (EAPs) is also being carried out. MoRTH is also implementing a comprehensive bridge building program called “Setu Bharatam” where 1,500 bridges and 208 Railway Over Bridges (ROB)s /Railway Under Bridges (RUBs) are being taken up. Other ongoing programs of MoRTH are - a special package for Jammu & Kashmir and NH(O). V. NHDP had aggregate length of 55,792 kms. Out of this, 30,108 kms have been completed already and another 4,900 kms will be completed this year. The balance is 20,784 kms against which projects for 6,399 kms are under implementation. Of the remaining 14,385 kms, 4,385 kms are a part of Bharatmala Component like Corridors/Expressways. Unfinished outstanding stretches of 10,000 kms will be subsumed in Bharatmala and implemented as an integrated program. The extensive experience gathered by MoRTH and its implementing agencies like NHAI in implementing NHDP shall be utilized in implementing Bharatmala. Identified Highways Corridors of Economic importance are expected to carry 25% of freight in the coming years. Once built, the National and Economic corridors along with their inter-corridor and feeder routes would be able to carry 80% of our freight traffic. Around 26,200 km of Economic corridors have been identified to be developed as Economic corridors out of which 9,000 kms are being taken up in Phase-I of Bharatmala. Around 8,000 km of inter-corridor and around 7,500 km of feeder routes have been identified out of which 6,000 kms are being taken up in Phase-I of Bharatmala. The Golden-Quadrilateral and NS-EW, corridors carry 35% of India‟s freight and would be declared as National corridors. The average traffic in the 6 national corridors is >30,000 PCU. The 6/8 laning of these corridors would be done as per need. The National Corridors have developed choke points impacting logistics efficiency. There is a requirement to build Ring Road and bypasses/ elevated corridors in addition to lane expansion to decongest these National Corridors. Further, Logistics Parks would also be developed at strategic locations to enhance logistics efficiency. A list of such identified locations of Logistics Parks is attached. Around 5,000 kms are being taken up under this category in Phase-I of Bharatmala. Around 3,300 km of border roads have been identified to be built along the international border for their strategic importance. Around 2,000 km of roads are required for connecting India‟s major highway corridor to International trade points so as to facilitate Export-Import (EXIM) trade with our neighbors: Nepal, Bhutan, Bangladesh and Myanmar. Around 2,000 kms are being taken up under this category in Phase-I of Bharatmala. Around 2,100 km of coastal roads have been identified to be built along the coast of India. These roads would boost both tourism and industrial development of the coastal region. Around 2,000 km of port connectivity roads have been identified to facilitate EXIM trade with an emphasis to improve connectivity to non-major ports. The roads identified have been synergized with the Sagarmala program. Around 2,000 kms are being taken up under this category in Phase-I of Bharatmala. Certain sections of National and economic corridors have traffic exceeding 50,000 PCUs and have also developed several choke points. About 1,900 km of these stretches have been identified for development of green-field expressways. Around 800 kms are being taken up under this category in Phase-I of Bharatmala. •	Improving the quality of roads - The launch of the scheme has been done for bring a new wave of development in the nation in the form of well-maintained and developed roads. Under this project, the construction of roads, in all parts of the nation will be undertaken. •	Total road construction - As per the draft of the scheme, government and the ministry will strive to complete new roads, which will add up to a whopping 34, 800 kms. 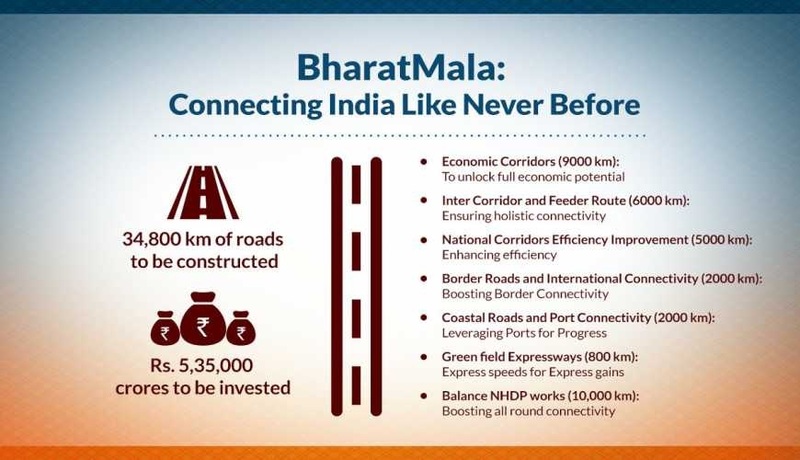 •	Integrated scheme - The Bharatmala is the name that is given to the road development and it will include many other related schemes as well. With the completion of all the schemes, the overall success of the scheme will be guaranteed. •	Total tenure of the program -The central government has the plans of finishing the scheme within a span of five years. Thus, all is set for finishing the first phase before the end of 2022. •	Segmentation in phases - Due to the sheer magnitude and spread of the scheme, it will be divided into seven distinct phases. As of now, the first phase in under construction. •	Constriction on a daily basis - To finish the first phase in time, the respective department has made efforts of constructing at least 18 km of path on a daily basis. To beat the clock, continued efforts are being made to raise it to 30 km/day. •	Different categories of road construction - It has been highlighted in the official draft of the scheme that to provide better connectivity, the construction of various categories of roads will be undertaken. •	Multi-source of finding - One source will not be enough for funding a mammoth project. Thus, the government will have to depend on other sources for generating adequate money to meet the expenses. •	Improve reach and connectivity and make the movement of man and material more efficient. •	Connect backward and tribal areas, areas of economic activity, places of religious and tourist interest, border areas, coastal areas and trade routes with neighbouring countries. 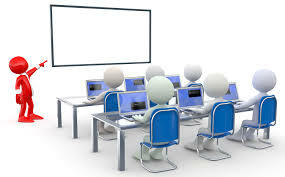 •	The programme will also help generate a large number of direct and indirect employment. The project is expected to create nearly 100 million man-days of jobs during the road construction. •	The project is expected to create 22 million jobs as a result of the increased economic activity across the country due to better road connectivity.